The mission of The Pet & Wildlife Fund is to support pet communities by fostering a peaceful co-existence of humans and animals. The Pet & Wildlife fund is the philanthropic arm of Montclair Veterinary Hospital. PWF (Pet & Wildlife Fund) is a 501(c)3 non-profit organization striving to make maximum impact through education, product and service donations, and referral services. PWF is funded by personal and community contributions. The mission of The Pet & Wildlife Fund is to support pet communities by fostering a peaceful co-existence of humans and animals. 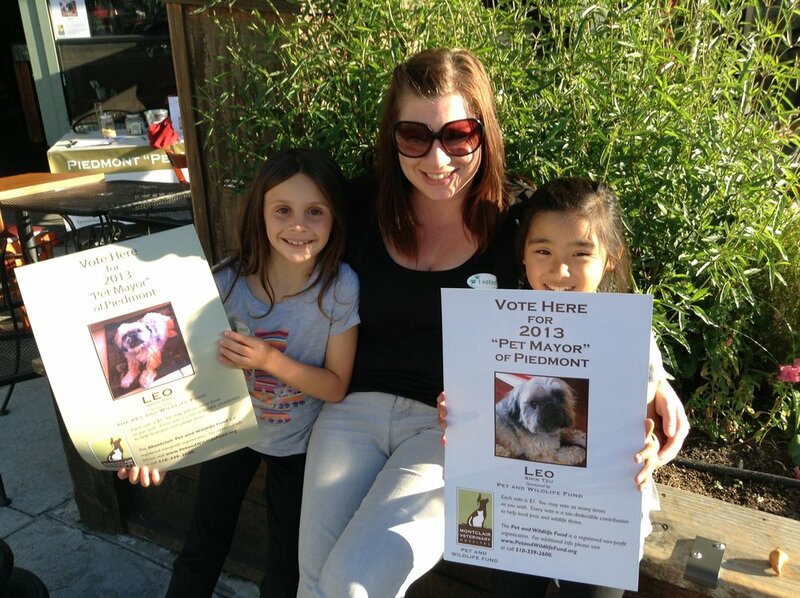 The Pet & Wildlife fund is the philanthropic arm of Montclair Veterinary Hospital. PWF (Pet & Wildlife Fund) is a 501(c)3 non-profit organization striving to make maximum impact through education, product and service donations, and referral services. PWF is funded by personal and community contributions. Your donation allows the Pet & Wildlife Fund to respond to the needs of the pet community through education, products, and services. By making a charitable donation to the Pet & Wildlife Fund, you are there for millions of animals and their caretakers who face financial and medical struggles every year. Everything we do depends on the needs of the animals and people that we serve. We could not do it without donations from big-hearted people like you. Many wild animals found by individuals, as well as domestic animals owned by schools or non-profit organizations, are brought into Montclair Veterinary Hospital for medical treatment. After examination and treatment, animals are returned to their owners or transferred to local wildlife rescue centers for rehabilitation and release. Your donations to the Pet & Wildlife Fund help us provide medical services to pets and wildlife in need. Yellow phase golden pheasant brought to Montclair Vet Hospital by animal control officer from a foster home where it was being cared for after its owner had died. Red-throated hummingbird brought to Montclair Vet Hospital, examined, treated, and then transferred to a local wildlife rescue center for rehabilitation and release. Bat, after falling and breaking its wing, eating meal worms. This photo was taken before the bat was sent to rehabilitation at the Yggdrasil Urban Wildlife Rescue. Baby Barn Owl orphan found at Golden Gate Fields when a barn was being demolished. This baby owl was brought to Montclair Vet Hospital, examined, treated and then transferred to local wildlife rescue center for rehabilitation and release. Hermann’s tortoise brought to the Montclair Vet Hospital. Cormorant brought in by animal control to Montclair Vet Hospital. Staff obtained radiograph to make sure no bones were broken and no fish hooks were lodged in the bird. Sharp-shinned hawk found in Oakland and treated by Montclair Vet Hospital for a puncture wound. The hawk was later transferred to a local wildlife rescue center for rehabilitation and released. Pelican with a fish hook in its beak was brought to Montclair Vet Hospital, examined, treated, and then transferred to a local wildlife rescue center for rehabilitation and release. Canada goose brought to Montclair Vet Hospital, examined, treated, and then transferred to a local wildlife rescue center for rehabilitation and release. Chicken found by Oakland animal control. Chicken was treated for a broken leg and rehabilitated by Montclair Vet Hospital. She was named Waffles and was later adopted by a former staff member. White opossum orphan brought in Montclair Vet Hospital, examined, treated, and then transferred to a local wildlife rescue center for rehabilitation and release. Orphan opossum found in an elevator in Emeryville. This opossum was brought to Montclair Vet Hospital, examined, treated and then transferred to local wildlife rescue center for rehabilitation and release. Baby rabbit orphan brought to Montclair Vet Hospital, examined, treated, and then transferred to a local wildlife rescue center for rehabilitation and release. A fawn, brought in by Piedmont animal control, found in a residential yard. The doe was seen nearby after the fawn had been taken. Staff at the Montclair Vet Hospital examined the fawn and released him to same animal control officer, who then returned the fawn to the original site and watched mom and baby reunite. Lee Richter, is the founder and Executive Director of The Pet & Wildlife Fund. For more than 30 years, she has built successful, dynamic, community driven businesses. Her unique vision and system generates massive results. Her highly successful companies produce millions of dollars, hundreds of jobs, educate thousand, and support strong communities. Lee is CEO of the award-winning Montclair Veterinary Hospital in addition to Holistic Veterinary Care, with a mission to improve health care for pets through natural medicine. Lee helped her husband, “America’s Favorite Veterinarian” Dr. Gary Richter, achieve his dream of becoming a small animal veterinarian and they own two veterinary hospitals in the San Francisco Bay Area. In 1984, Lee launched Richter Communications because she is passionate about designing and launching marketing campaigns and products that represent her mission and her values. Her business acumen and talent has generated national and international results with clients such as Bank of America, Merrill Lynch, Robertson Stephens, Autodesk, Stanford Research Institute, Edmunds.com, The Pet Concierge and Del Webb among others. Lee would tell you that her life would not be complete without her family, friends, dogs, cats and community. She is a loving and devoted mother to her 11-year- old daughter, Abbey. Lee teaches Abbey how to be empowered every day, and with Lee’s help, Abbey became a best-selling author at the age of 9. Lee and her family love to travel and explore the world together.